Other than Arabic script written on colored balloons, nothing directly tells what the four balloons placed on sand tower intend to convey. Though it looks like any other conceptual contemporary art installation, “The Arab Spring” sums up the current political situation in Arab countries. 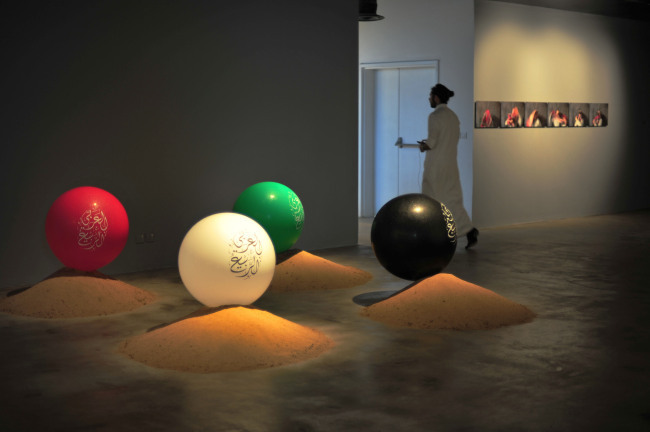 Made by Saudi Arabian artist Faisal Samra, the work consists of four balloons in white, black, red and green, each representing flag colors of Arab nations. The balloons speak for countries on the verge of uprisings. Samra had displayed an installation of five balloons in his prior exhibitions as symbols of five countries jolted by revolts since 2010 ― Tunisia, Egypt, Yemen, Libya and Syria. The balloon installation is part of the artworks on view in the Arab contemporary art exhibition held as part of the 7th Arab Cultural Festival. The show is a good chance to get a glimpse of lesser-known Arab contemporary artists and their work. The exhibition kicked off in Seoul last week and will move to the Busan Museum of Art for a presentation in Korea’s second largest city from June 4 to July 3. Though in a poetic and subtle fashion of expression, Arab contemporary artists seek to engage in the social and political conflicts their countries face. At the Seoul exhibition, 14 artists from 10 Arab countries including Syria, Saudi Arabia and Iraq showcase works of photography, installations, paintings and films, all embedded with layers of metaphors and symbolic images. Saudi Arabian artist Abdulnasser Gharem portrays Arab countries as places that are not the same since 9/11 through a diamond dust-studded print work featuring two contrasting images. Against the background of beautiful Arabic patterns, an airplane runs down a runway, which is an image reminding viewers of the attack. Take a closer look and you can see calligraphic phrases randomly sampled from the announcement that former U.S. President George W. Bush made in vowing his fight against terrorism. In the works by Syrian artists, the influence of the ongoing civil war is noticeable. 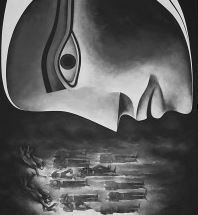 Artist Safwan Dahoul’s painting “Dream” shows scenes of devastation in the Syrian civil war. But the artist also depicts companionship shared by fellow citizens on the war-torn streets of his country. Another Syrian artist, Ammar Al Beik, expresses his nation’s suffering with a twist. His works “Metallica Series” feature combined images of love and war-damaged buildings in his country. The artist gained kudos for another work “Freedom Graffiti” that went viral on social media in 2013. The work suggestive of Gustav Klimt’s “The Kiss” is interpreted as a paradoxical protest against his compatriots’ distress since the rebellion began. The two Syrian artists live and work in Dubai as most of the other artists who are presenting their works in the exhibition do. “It’s in search of freedom of expression,” Kim Yu-yeon, curator of the exhibition, said. Palestinian-Iraqi artist Sama Alshaibi works away from her home country as well. She is a naturalized U.S. citizen who teaches at the University of Arizona, Tucson. Still, the theme of her artwork is conflict surrounding occupied territories between Palestine and Israel. Her photograph portrays a standing person as a sign of tension between an individual and his or her society. Another Palestinian artist, Raeda Saadeh, deals with the life of women constrained by social norms. Her work also contains a metaphor to living in the “occupied territory” and the little progress made in the fight between Israel and the Palestine on the territorial issue. The Seoul exhibition will run until May 31 at NEMO, Blue Square in Hannam-dong, Seoul. It will open again at the Busan Museum of Art from June 4 to July 3. For more information, visit http://fest.korea-arab.org.